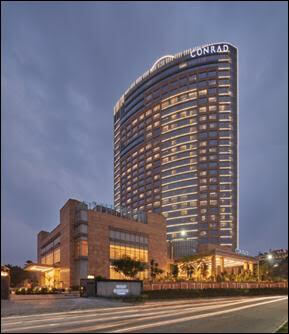 Conrad Hotels & Resorts celebrates further expansion in India with the opening of Conrad Bengaluru. Soaring 24 stories above Bengaluru’s Central Business District, the new luxurious hotel, which is owned by Prestige Group and managed by Hilton, is superbly located in the city providing excellent accessibility to prime business, technology, art and entertainment districts. Featuring 285 luxurious guestrooms including 21 suites, Conrad Bengaluru offers fivedining and bar experiences, a full-service spa and salon, abundant event space, a 24-hour fitness center and an outdoor temperature–controlled infinity pool overlooking the expanse of the city as well as a dedicated kids’ pool. 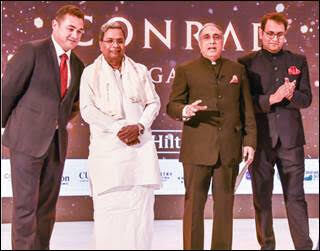 “We are delighted to establish Conrad Hotels & Resorts in this vibrant capital city of Karnataka. Conrad Bengaluru enhances our fast growing portfolio of 34 properties and underscores our commitment to delivering exceptional hotels in key gateway locations to meet the growing needs of global luxury travelers,” said John T. A. Vanderslice, global head, Conrad Hotels & Resorts. “An inspiring destination, Conrad Bengaluru will delight guests with intuitive and customized service, as well as provide them access to a world of connections and inspired experiences." "The Prestige Group is synonymous with innovation and has been lauded for introducing many firsts to the city. In keeping with this vision, it gives us great pleasure to partner with Hilton in bringing the esteemed Conrad brand to Bangalore. Amidst the robust tourism outlook, the much-anticipated opening of Conrad Bengaluru will definitely be a game changer in the already dynamic hotel scene here. Moreover, Bangalore has the distinct advantage of being a preferred destination for both conventions and conferences. Hence, I see the hospitality industry thriving here. We look forward to a long and positive partnership with Hilton in further elevating the hotel industry in India," added Irfan Razack – CMD, Prestige Group. - Caraway Kitchen offers the lively flavors of the world with four open concept kitchens that take culinary inspirations from India, Italy, Americas and East Asia. - Tiamo presents robust Mediterranean flavors made with simple quality ingredients in a stylish al fresco atmosphere. The café’s Mediterranean bistro classics are the perfect option for guests who roost at the infinity pool deck on balmy days and cool evenings. - Mikusu celebrates the culinary cultures and artistry from Japan, China and Thailand. The restaurant and bar offers dishes imbued with a strong sense of their heritage, and paired with a curated range of exquisite sake and exotic Asian cocktails. - Indian Durbar pays homage to time-honored Indian recipes and flavors. Set in an understated yet luxurious ambience, diners can anticipate novel gourmet experiences that are fit for the royalties. - The Lobby Brew, the lounge at the lobby, features an extensive beverage menu and have tapas and finger foods throughout the day. As part of Hilton, Conrad Bengaluru participates in Hilton Honors, the award-winning guest-loyalty program for Hilton's 14 distinct hotel brands. Members who book directly have access to instant benefits, including a flexible payment slider that allows members to choose nearly any combination of Points and money to book a stay at an exclusive member discount.